Red Rock Research in the news . . .
Feb 1, 2012 - Red Rock Research announces a 4-day CBAP Exam Prep Boot Camp. Nov 2, 2011 - Red Rock Research expands to Phoenix, AZ. Read about it here. 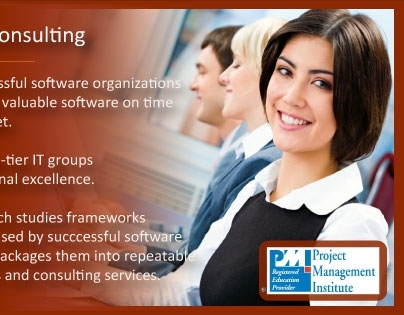 Nov 2, 2011 - Red Rock Research discusses PMP/CAPM courses in Salt Lake City. Read about it here. Sept 1, 2011 - Red Rock Research announces a 4-day PMI-ACP Exam Prep Boot Camp. June 5, 2011 - Red Rock Research is the primary sponsor of the PMI Northern Utah Chapters's Professional Development Day convention. April 27, 2011 - Red Rock Research expands to Dallas, TX. Read about it here. Jan 1, 2011 - Red Rock Research announces a 5-day PMP Exam Prep Boot Camp, and a CAPM Exam Prep Boot Camp. Oct 21, 2013 - Red Rock Research announces a 3-day ITIL Exam Prep Boot Camp. Oct 21, 2013 - Red Rock Research sponsors the PMI Northern Utah Chapters's Professional Development Day convention. Oct 10, 2013 - Red Rock Research announces a On-Line Test Bank for use with their ITIL and PMP Exam Prep courses. 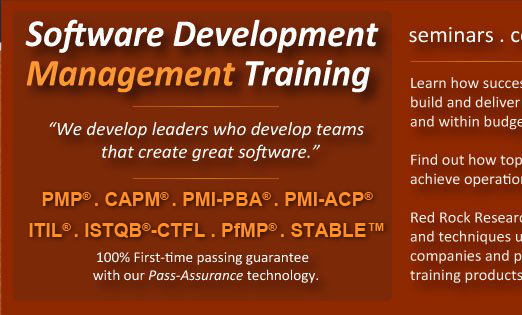 Oct 1, 2013 - Red Rock Research announces a Software Development Best Practices Forum. Nov 13, 2009 - Mike J. Berry and Bill Harris of Red Rock Research present 'Measuring the Cost of Quality' to the Utah Technology Council's CTO forum. June 24, 2009 - Mike J. Berry of Red Rock Research edits 2nd Edition of Minkyu Lee's 'Generating an MS-Word Document with StarUML' User Guide. Buy it here. June 6, 2009 - Red Rock Research announces Software Development Best Practice Seminars for software professionals. May 20, 2009 - Red Rock Research posts a free Software Requirements Specification (SRS) template for public consumption. Find it here. April 30, 2009 - Mike J. Berry of Red Rock Research speaks at BYU's School of Information Technology about "Software Development Dynamics They Don't Teach You in College." March 3, 2009 - Mike J. Berry of Red Rock Research announces participation in the iEEE 1175.5 Object Modeling Component Interface Standards committee. February 24, 2009 - Aspen Media Solutions engages Red Rock Research for software development & management consulting. February 9, 2009 - Mike J. Berry, from Red Rock Research, speaks at BYU's School if Information Technology about "Software Production Support." Dec 03, 2008 - Mike J. Berry, from Red Rock Research speaks to BYU IS & IT students about Operations Management. Oct 17, 2008 - Mike J. Berry, from Red Rock Research attends Steve McConnell's '08 Software Executive Summit in Seattle, WA. Sept 2, 2008 - Mike J. Berry, from Red Rock Research attends Joel Spolesky's '08 Business of Software Conference in Boston, MA. Oct 28, 2007 - Mike J. Berry, from Red Rock Research attends Steve McConnell's '07 Software Executive Summit in Seattle, WA. Sept 20, 2007 - Red Rock Research announces "Jasper" a downloadable free Function Point Counter software tool available to the public. Find it on our Tools and Utilities page. Sept 10, 2007 - Red Rock Research announces downloadable Project Plans, WBS Management Toole tools available free to to public. See our Tools and Utilities page. August 10, 2007 - Red Rock Research announces the RoundTable event "Ensuring the Voice of the Customer in Software Development." August 1, 2007 - DAKCS software, in Ogden, UT, engages Red Rock Research to improve their software quality and delivery procedures. If you are looking for coding or application training, check out the training-classes.com directory of IT-related training seminars.